The combination of a mild climate, beauty, and variety of landscapes and the warm hospitality of a population with thousands of years of traditions, makes Sardinia the ideal destination for active holidays. Sardinia is the second largest island in the Mediterranean lying just west of Italy and below the French island of Corsica is an enchanting island and sanctuary for adventure and nature explorers and it’s the ideal place to test boundaries in a multitude of exciting ways. The island is blessed with an 1800 km jagged coastline, pristine white sandy beaches and a commanding rugged interior that begs the visitor to climb, play, trek and push limits. Sure, the first thought is that you may need to come back again. But where to start first and what to do? Here is our distilled list of 6 adventures to do in Sardinia. 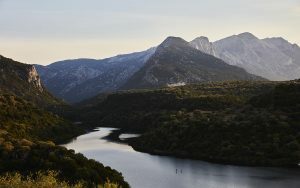 We focused on activities in the unique natural wonders in Sardinia and the ones that are most connected to the local culture. From Islands to coast and mountains. Sardinia, is blessed with a 1800km jagged coastline . Add to this the crystal clear waters and number one activity holiday in Sardinia is a water based adventure. SUP in beautiful natural surroundings, pleasant weather, delicious cuisine and a slow pace of life. Such simple, yet perfect, ingredients for a active holiday in Sardinia. Paddling from the river to the sea on your SUP or vice-versa? In Sardinia, you can enjoy the experience of a fairy-tale scenario, while the sound of the waves accompanies you through the unspoilt nature. To do an river and sea with a stand-up paddle and move through turquoise waters on the way – it is the kind of thing you can’t do in many places in the world. 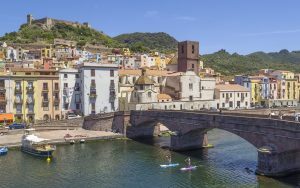 On island Sardinia you can expect that and add to this exploring little fisherman villages on the way, checking out a roman ruins, marin caves and it just adds perspective to adventure. Even better, take a SUP course before you venture out. Come back from an active holiday with a new skill set, and newly discovered love and hobby. All the best things in life change us for better. Adventure holiday should (and can) do the same. Take a look at the specific SUP itinerary, read more about it. The coastline of Sardinia is fascinating. Some stretches are limestone, some are sandstone, some are pink granite, some white granite…all rock types that are easily sculpted by wind and wave. It makes for some really stunning destinations and scenery for the paddler. 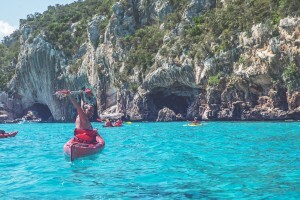 The eastern coast, particularly the gulf of Orosei in the waters of Cala Gonone, is the perfect place for kayaking enthusiasts who wish to paddle along and discover the coast. The silence, the bewitching sound of the waves, the unusual landscapes and the underwater wonders of the crystal clear waters urge numerous visitors to explore the area every year. The Sardinian coasts are one of the most charming scenarios for water trekking, thanks to the numerous, spectacular coves, cliffs, caves and beaches, where you can stop off to take a breather and have a snack. Sardinia has lots to offer to climbers of any level that cross its path. 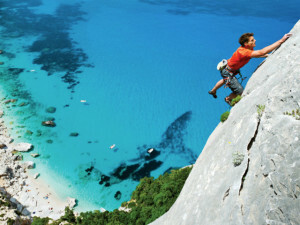 From bouldering to multi pitch, Sardinia contains a buffet of climbing styles that will satisfy any climbers appetite. The island is known for its world class climbing and has 6 main climbing areas that together total over 4,000 routes. So, suffice to say, there is no shortage of climbing on the island, not to mention it’s growing! The growing popularity of climbing in Sardinia has resulted in the development of hundreds of new boulder problems and routes just in the past couple years, and the potential for even more development is still huge. The great rock climbing areas in Sardinia are Cala Gonone on the eastern coast, Capo Caccia near Alghero and Capo Testa near Santa Teresa di Gallura on the North. You will find routes for all levels, so you can also bring with you persons, who have never done climbing before. The wind has been a part of the local culture since ancient times. Since this island in the middle of Mediterranean Sea is a very windy area. So, active holiday in Sardinia should in some form be about the wind. 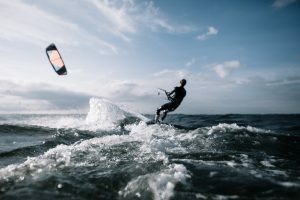 Sardinia is considered a jewel for kite surfers and windsurfers from all over the world. 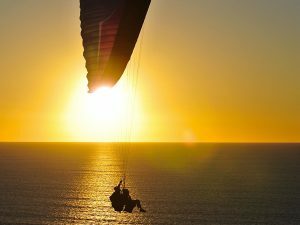 Best spots for wind-based activities are located mostly on the north of the island. Located in the north of Sardinia near Palau, Porto Pollo boasts two large bays and seven kilometres of open sandy beach, making this an ideal destination for beginners, intermediates and advanced riders alike. Sardinia can be considered a true surfers paradise. Its emerald green sea, deserted golden beaches and its relative isolation mean that surfers can discover for themselves that unique place with that unique wave. 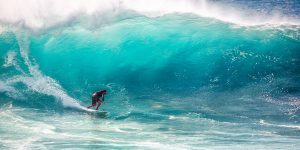 Thanks to the almost constant winds, conditions for Surfing in Sardinia are good in summer as in winter, even that if the best season are winter and spring. Sardinia has an high frequency of surfable days: about 200 surfable days per year. Waves quality is excellent everywhere in Sardinia. On the west coast of Sardinia, in particular conditions, the waves can exceed 4 m.
Capu Mannu is the most famous surf spot in Sardinia island and one of the best in the Mediterranean Sea: 30 km from Oristano, this is a spot facing south west which, thanks to the strong mistral, offers waves also up to 4 m. Recommended only to experts due to the rock bottom and inshore currents. It is very crowded on weekends. The water is perfect and the scenery of the promontory very beautiful.